The Aztecs traded everything, and it was an important part of their life, and their economy relied heavily on agriculture and farming. Aztec Farmers grew beans, squash, avocados, tobacco, hemp, and peppers but the most important crop was corn. In spite of their primitive ways and farming tools, Aztec farmers produced enough food to supply not only their own needs, but also those of the entire city, and this played a pivotal role in the economy and trade of the Aztec civilisations. Aside from crops, the Aztecs market offers various goods and services, including everything you can think of. Raw materials, finished products, jewellery, wood and even medicine could be bought in this one stop shop, and the main gathering ground for the Aztecs. Their method of exchange was through tribute and trade. They bartered using different currencies, but the economy in Aztec life was essentially driven by this marketplace, the heart of the Aztec society. The Aztecs farmed the chinampas where were shallow lakes filled with mud or wet soil formed into a square shape. These tiny mounds of land were very fertile making it conducive for growing crops. 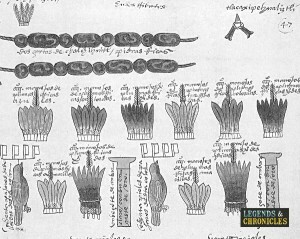 Their consistency made it possible for the Aztecs, who at that time did not have complicated tools, to make use of just sticks to turn the soil. To this day these floating gardens exist still in Mexico City, and at the time formed the backbone of the Aztec farming system. Based on Religion, the Aztecs had specific gods that they worshipped related to farming. Centeotl was the corn god, while Tlaloc was their rain and fertility god. Huitzilopochtli, the god of war and sun required human blood and hearts so that the sun would rise each morning, which is of course essential to farming. Therefore the Aztecs held many religious ceremonies were important to celebrate harvesting and planting, so that the Aztecs could ensure fertility from the gods. Trade was extremely important and so the traders were thought of highly in Aztec society. They were a class below the nobles but above the commoners and this special subgroup was mostly inherited. Merchants who travel far beyond the Aztec city were called pochteca, and they ruled the markets during the Aztec empire due to their far flung artifacts and goods which could not be obtained within the confines of the Aztec city otherwise. Back in the day, the Aztec merchants had to carry most goods by using a tumpline which was a forehead strap. This was hard work and while the merchants demanded respect and status they would also have to work hard. They travelling long and far, even traversing across waters making use of canoes. The Marketplace or as the Aztecs called it the Tianquiztli was located near the main temple at the centre of the community in all major cities. This position was important because as we have mentioned before, the marketplace in Aztec times was the heart of the trade, the system that kept the Aztec civilisation moving, and provided the hub for the citizens. The Spanish conqueror Cortes reported that the largest market of that time was the market of Tlatelolco, the sister city of Tenochtitlan. Up to 60,000 people gathered there daily as it was open 24 hours a day all through the year! There were smaller Aztec markets that specialized in a specific kind of goods or services. For example, one market would be well known for selling slaves, while another would specialize in the sale of jewellery. The smaller ones were open only five days a week in most cases, while the larger markets were open for seven days a week, allowing Aztec people to get what they needed any day of the week. In Aztec times, the common currency was of course trade and bartering. The two most common way the Aztecs bartered was through the use of cocoa beans made into chocolate and cotton, and interesting the word chocolate actually came from the Nahtul language xocolati. They vary in value depending on the quality of the beans or the cotton. 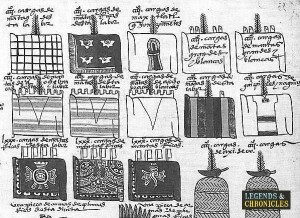 The Aztecs also used a form of money called the Quachtli, although this wasnt as common as bartering or trading, and was again a form of cotton cut into standardized lengths. Lastly and most strange, the Aztecs sometimes practised selling their children in exchange for goods or services. Cocoa beans were the most common and main currency that the Aztecs used. The higher the quality of the beans, the higher its value. The quality of the soil the beans grew in and the favourable weather conditions reflected in beans quality, and the Aztecs used this currency for small purchases. Interestly the name of the cocoa bean, was actually referred to as cacao by the Aztec people, and comes from a tree of course named, the Theobroma Cacao. Where the english version of the word changed is truly a mystery, but is though that it could have been diluted or said or spelt wrong at some point and the word cocoa stuck. Larger purchases were traded with Quachtli or cloth. Its value grew if it was woven tightly and it could costs as much as 300 cocoa beans. In Aztec times it was believed that around twenty lengths of even the loosely woven cloth was enough for an average family to live on for a year! So of course Quachtli was important but also quite rare to own in large amounts. Used by all classes in Aztec society, tajaderas, or hoe money, was made of thin copper and had a standard weight and size. It is sometimes called hoe money because of its resemblance to the shape of a hoe. Tajaderas were purchased with cocoa beans and then were used to trade for other goods at Tlatelolco, the main marketplace that was regularly visited by merchants from other parts of the world. Trading was in Aztec times a very important act, that kept society moving and pushing forward. The Aztec people would trade daily, visit the marketplace and use the various forms of accepted currency to make their purchases. This practise is of course not unique to the Aztec people, but with the marketplace being a large part of Aztec society it was as import here as anywhere.